In this video, we are going to show how you can AutoTweet from Joomla! to Facebook. Download the component from Extly's Download Area, unzip and install AutoTweetNG in Joomla! backend with the standard procedure. About AutoTweetNG updates: Install the update with the same procedure. Once you have proceeded with the installation, AutoTweetNG component has been installed. System plugin - AutotweetAutomator has been installed and enabled, to process new content and posts every 3 minutes, and System plugin - AutotweetContent has been installed and enabled to publish Joomla! content. STEP 2: Create and authorize a social channel. Go to AutoTweetNG Control panel, there select Channels tab to create a new channel. AutoTweetNG requires Facebook account authorization. Each Profile, Page or Group is a different channel. On Channel Tab, click on New, select the Channel Type and complete the Channel Data. Save. On Channel details, select "Use your own app"=Yes. Now you have to create your Facebook app. Login at https://developers.facebook.com/ apps with your Facebook username and password. Create a new app, selecting website option. Define App name and category. Enter your website URL. Go to Developer Dashboard to get your App ID and App Secret. Make sure "Stream post URL security" is OFF. This setting allows URL shorteners usage or different domains. Back to Channel Configuration, fill the form with App ID and App Secret. Go to Authorization tab to authorize the app in the Facebook account. After the authorization, the Facebook application provides the Access Token to validate and fill the User-ID. The authorization opens a dialog to Facebook. If the dialog is not shown, double-check to confirm if your browser is blocking the dialog. In Chrome, the pop-up blocker could be preventing the opening of the dialog. In Firefox, the function activity tracking could be blocking the task. Fill the Access Token and click on "Step 2: Validate" The User ID will be filled. Go to Channel Selection tab and select the specific Facebook channel (page, group or profile). Click on "Step 3: Validate Channel" and save. AutoTweetNG is ready to publish! A new Facebook Channel has been created. By default, all new articles are going to be published on Facebook. We love your feedback, it's our way to improve. This presentation was created with your help. Please post a rating and a review at the JED . It really helps. In this video, we are going to show how you can AutoTweet from Joomla! to Twitter. Now you have to create your Twitter Authorization App. Login at https://apps.twitter.com/ with your Twitter username and password. Create a new app to start using the Twitter API. Fill Application Details, and click on "Create your Twitter application". Make sure that Access Level is "Read and Write". Check it on Permissions tab. Go to Keys and Access Tokens tab to get your Keys. Click "Create my access token" to generate your Consumer Key (API Secret), Consumer Secret (API Secret), Access Token and Access Token Secret. Save. Back to Channel Configuration, fill the Channel Details with your Keys and Tokens. Click on "Validate" and the User ID will be filled. Save. A new Twitter Channel has been created. By default, all new articles are going to be published on Twitter. 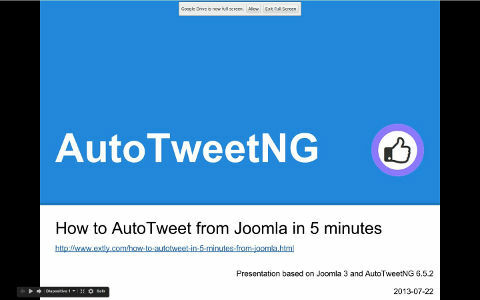 In this video, we are going to show how you can AutoTweet from Joomla! to LinkedIn. Go to AutoTweetNG Control panel, there select Channels tab to create a new channel. Every LinkedIn Profile or Company is a different channel. A channel access requires the account authorization. First, you have to create your LinkedIn application. Login at https://www.linkedin.com/developer/apps with your LinkedIn user and password. Create a new application. Fill the application data and submit. Select r_basicprofile, w_share and rw_company_admin permissions. Back to AutoTweetNG control panel, on Channel Tab, click on New, select the Channel Type and complete the Channel Data. Save. Fill the Channel Details with your Client ID and Client Secret. Save. Accept the permissions dialog. User ID will be filled. Click on "Validate" and Save.